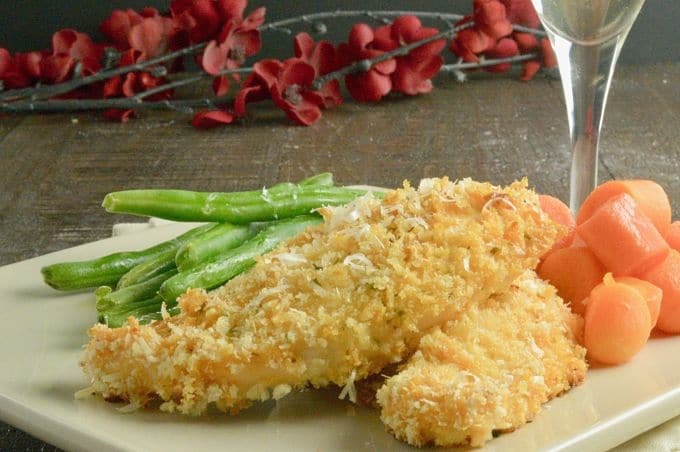 Panko Baked Chicken is an easy weeknight dinner recipe your company will love. Dipped in salad dressing, coated with parmesan herb panko then baked until crispy. This Panko Baked Chicken recipe is a guest post I did for a my friend who writes at The Gingered Whisk while she was on maternity leave. The Panko crusted chicken worked great for her readers looking to get a meal on the table quickly but also works well for us here looking for delicious comfort food meals that are easy to serve while entertaining! If you need another option for a quick dinner on the table I also have this Air Fryer Chicken Parmesan recipe you would enjoy. Today Im excited to share with you a recipe for that my family has used for years, Panko Baked Chicken or panko crusted chicken. Its made in no time at all, with just a few ingredients you probably already have. It’s baked in the oven so its a little healthier than frying chicken which is an added bonus too! Just in case you would rather have real Southern Fried chicken please feel free to check out my Grandma Oma’s recipe here! 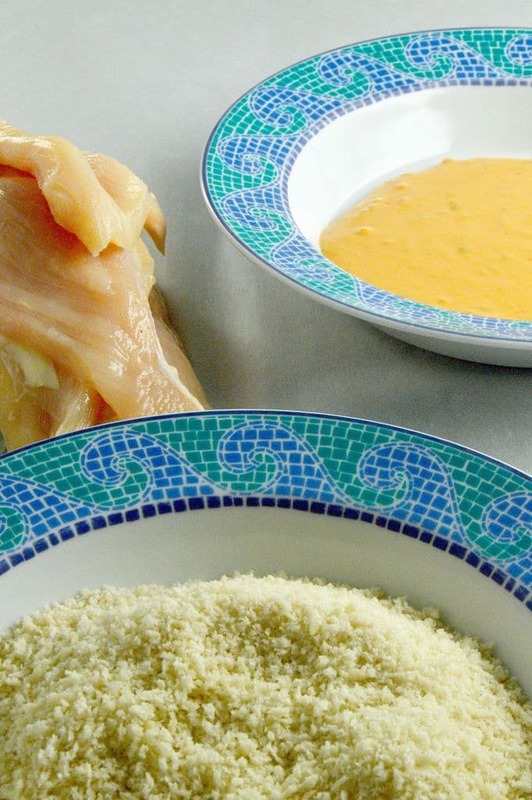 What is the difference between Panko and traditional Breadcrumbs? Panko is made from bread that is cooked with electric current instead of heat from an oven. Because of the way it is cooked, it essentially has no crusts on it. In the cooking/preparation process the bread is allowed to rise three separate times which makes the final panko very light and airy. Panko Breadcrumbs are crispier when baked and doesn’t absorb the oil/fat as much as traditional breadcrumbs do. If you would like to see the actual process of how Panko is actually made, this video from Uppercrust Enterprises is fascinating! 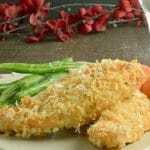 Can I substitute regular breadcrumbs for panko breadcrumbs in this recipe for Panko Baked Chicken? Technically yes you can sub them in a pinch. However, I do not recommend substituting them because the chicken will not be as crispy once baked. 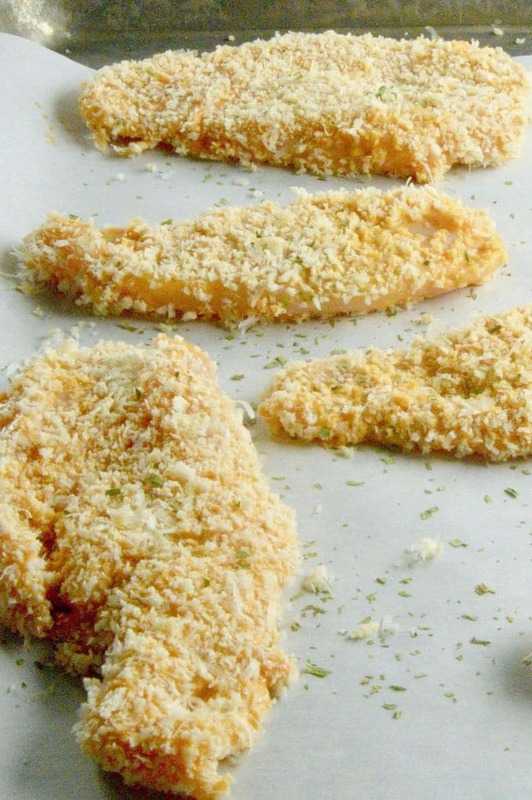 Many recipes use breadcrumbs for oven baked chicken, but I prefer the lighter, crisper texture of panko baked chicken. Tips for making this Panko Baked Chicken Successfully! The trick to making this healthy panko baked chicken is setting up the dipping station so that you minimize the mess and following a few simple tips when preparing the chicken before dipping them. When you’re making the chicken, set the dipping station up into bowls that go in the order that you are going to use them. The photo above is an example where I will first take a piece of the chicken, dip it in the dressing, then directly into the panko. What you don’t see in this pic is the pic of the tray which is right next to it prepped for the oven. It makes it easy to drop the finished dressed up chicken piece to go right on to the tray eliminating an extra holding plate. See?! This tray was right there for me next to the dipping station! You’ll notice a couple of things that will help you with making this recipe successfully in these prep photos. I made sure and used thinner cuts of chicken so that it cuts down on the time in the oven for baking. you can buy the chicken pre-cut thinly but you can save a little money by cutting them yourself. When cutting them, you can then pound them to equal thickness so they are all the same for even cooking! I lined my baking sheet with parchment paper so that it was super easy to clean up afterwards. Basically toss the paper and wash it. No need for scrubbing off any excess coating that sticks to the tray if you use parchment paper! Another added bonus is you have free time while the chicken is baking to work on your additional side dishes to serve with it. You can also do like Jenni does here in her Sheet Pan Roast Beef and roast the veggies at the same time the chicken is baking right on the same pan. (Two sheet pans work too! ). Just be sure and cut the veggies into smaller bites because the chicken is only in the oven about 30 minutes and that way your veggies will cook completely! I suggest using Thousand Island dressing to use for dipping, but this recipe for Dressed up chicken is totally adaptable to what your family likes. Ive made it with Ranch Dressing and even a Blue Cheese dressing with rave reviews. If you sub a different dressing I do highly recommend using a creamier style dressing… a simple vinegar and oil dressing doesn’t hold the coating as well during baking and gets kind of greasy. I hope you enjoy this recipe for a quick meal for entertaining! 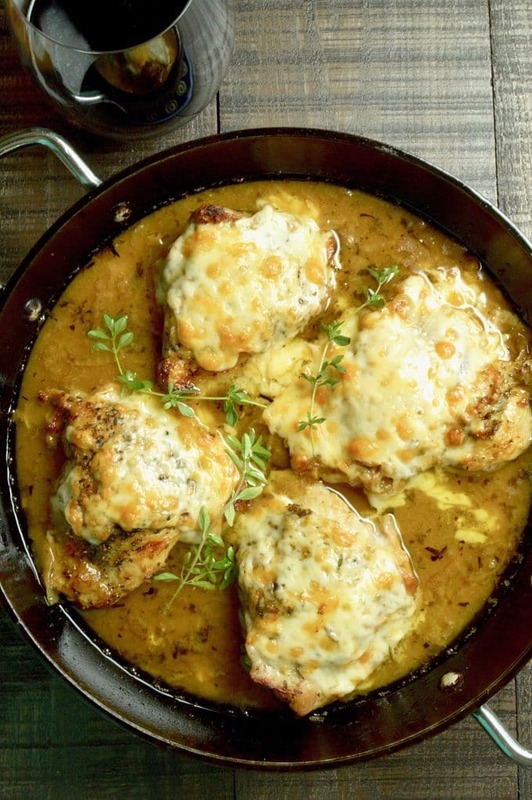 If you are looking for other chicken recipes you can also check out my recipe for French Onion Chicken (which just so happens to be THE most popular recipe on my site!) or the Parmesan Crusted Pork Chops! 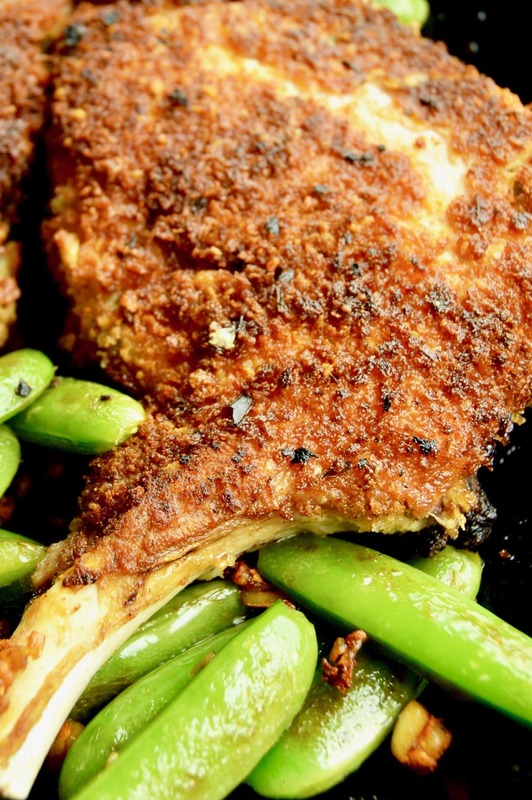 Panko Crusted Baked Chicken is an easy weeknight dinner recipe your family will love. Its dipped in salad dressing, coated with parmesan herb panko then baked until crispy. Both Kids and adults alike will enjoy it! 1 teaspoon dried tarragon you can sub oregano too! Prepare breasts to be small thin pieces of chicken. You can do what ever size you want, but they all need to be the same. Cut them in half so that each piece is about 1/3" thick. Then place them in plastic bag and pound them a little thinner to finish just under 1/4" thick. Pound gently, so they don't disintegrate when finished. The goal is to have all chicken pieces similar in size and width so that when you are baking them they cook evenly. In a small bowl place salad dressing. In a second bowl place the panko, salt, pepper, parmesan and tarragon. Stir to mix. Prepare your baking sheet by lining it with parchment paper. Prepare a dipping station with the chicken first, then dressing, then panko then tray in that order. One at a time, using one hand only dredge chicken in dressing, then panko making sure the chicken is evenly coated in both. Place the finished chicken pieces onto the tray about 1 inch apart. Calorie information was provided using the specific ingredients I used to make this recipe. If following a regimented diet, please calculate the information using specifically what you use to make it! Make a double batch of these. The crispy chicken works great as a salad topping the next day! This would be such a hit at my house! We are always looking for new ways to prepare chicken and this looks awesome! I’m a regular reader from the gingered whisk and made your recipe over the holidays. My in laws loved it and asked me for the recipe! It’s the first time my mother in law has liked ANYTHING I’ve ever made.. I have to thank you for this…. it was absolutely delicious! !